Tired of running out of hot water? Worried about the cost and efficiency of your old hot water tank? A tankless water heater could be the solution. Endless hot water: Unlike a traditional tank which needs to fill with water then heat it up, a tankless water heater will always provide you with a constant supply of heated water. That means no more cutting showers short or worrying about running two showers at the same time. Space saving: Tankless water heaters are great if you have a smaller space or just want to make better use of the space you have. They hang on your wall and can even be hidden from view in a cupboard. Cost saving: A traditional water heater needs to be working all the time to keep your water hot. A tankless heater heats the water as it’s used, so you’re saving on energy costs in the long run. 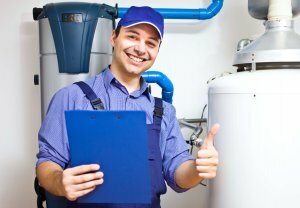 Our skilled professionals can diagnose and undertake any repairs you might need with your tankless water heater. If you notice any changes in the system including loud or unusual noises, or the water isn’t heating as quickly as it should, give us a call for a free, no-obligation inspection. When you’re replacing your old water heater there are a number of factors you need to consider that we can help with. We can offer a professional consultation before any work begins to help you understand what needs to be done, and what best suits your situation. Remember, more fixtures on your line and more demand for hot water in your home might require installing a different unit able to handle a larger volume. We’ll work with you to find out what best fits your needs. We can also help with insurance and obtaining any permits or the potentially valuable, cost-reducing City of Toronto rebates you may qualify for when you hire a licensed and insured company like Dr. Pipe to do any drain work that may be necessary for your repairs and installations.